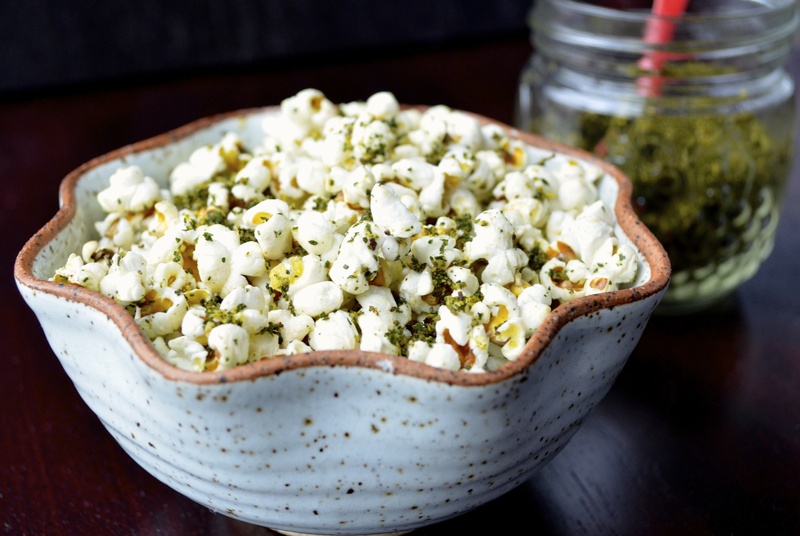 This recipe doesn’t just work for popcorn: it’s a versatile topping for any dish. Salads, toast with olive oil, home fries, and pasta… the list goes on. Or, you know, you might just eat it with a spoon. And that’s okay, too. Preheat the oven to 300 degrees F. Put the kale on a single layer on a parchment lined baking sheet. Finely zest the lemon over the kale and sprinkle with the smoked paprika, cayenne pepper, and salt. Put the walnut pieces on the pan, but not on top of the kale. Bake for about 15 minutes, until the kale is crisp but not burnt. Let cool completely—the kale should be crisp. If not, put the sheet back in the oven until it is, about 5 more minutes. Let cool completely. Put all of the contents of the tray, as well as the dulse, in a food processor. Pulse the mixture finely ground. Serve on popcorn that has been tossed with roasted walnut oil, or anything and everything else.